A group of trespassers managed to break into the Shard - western Europe's tallest building - and scale the pinnacle, it has emerged. Photographs taken at the summit of the 1,016ft (310m) skyscraper have been posted on the Place Hacking blog. The feat was apparently accomplished in December, after the group evaded security guards to mount a crane perched on top of the structure. A spokesman for the Shard's developer said security had been tightened. The group said they entered the site at 02:00 GMT from a walkway near London Bridge Railway station before walking up staircases to the 76th floor. The blog explained: "We waited for the guard to finish his round and go into his hut. "It took a few minutes of lingering before the walkway was clear - we grabbed onto the scaffolding pipes and swung off the bridge. "Hanging on the freezing pipes, we pulled ourselves on top of the walkway and laid down out of view, waiting for a reaction in case anyone had seen or heard us. It didn't seem so." The blog continued: "Staying low, we descended the other side of the scaffolding, behind the security hut where we could see the guard watching TV, not the cameras. "Quickly, we scampered across the yard and found the central staircase, pausing to see if there was any reaction. It was silent." Describing the moment they reached the vertiginous peak, the blog said: "We were so high, I couldn't see anything moving at street level. "No buses, no cars, just rows of lights and train lines that looked like converging river systems, a giant urban circuit board." A spokesman for Sellar Property Group, the Shard's developer, and contractor Mace, said: "We believe this is an incident which took place when we were undertaking both ground and structure works. "The breach was discovered very soon afterwards and security immediately tightened. "Today security on the site is tight with 14 night-time security guards on duty continuously, as well as 25 CCTV cameras together with a laser alarm system." A Metropolitan Police spokesman said that as no complaint had been made no action was being taken. 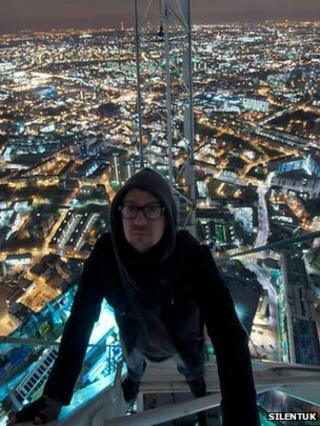 The self-styled Place Hackers are not the first unwanted intruders at the Shard. In February 2011 a fox was discovered living on the 72nd storey, subsisting on scraps of food left by builders. He was described as a "resourceful little chap".